Before going straight to sleep medications or stimulants for patients with sleep disorders, try prescribing bright light therapy (also called phototherapy). I find it useful for patients with insomnia, and circadian rhythm disorders such as delayed sleep phase disorder, advanced sleep phase disorder and jet lag. Bright light therapy is also helpful for patients with sleep disorders associated with post-traumatic stress disorder (PTSD), results of a 2010 study from researchers at the department of exercise science at the University of South Carolina in Columbia indicate. The researchers studied a group of 16 veterans who had been diagnosed with combat-related PTSD and randomly assigned them to treatments of 10,000 lux of light daily for 30 minutes or placebo, which came from an inactivated negative ion generator. Both treatments lasted four weeks. Study participants were administered the Beck Depression Inventory II, the Pittsburg Sleep Quality Index and the PTSD Checklist-Military Version to assess depression and sleep quality at baseline, weekly intervals and after study completion. The participants who received bright light therapy experienced a reduction in nightmares following therapies, the researchers found. They recommended bright light therapy as an effective adjunct therapy for PTSD. Other researchers have examined the role of bright light therapy, along with cognitive behavioral therapy (CBT), to treat insomnia. One study showed that older patients who have difficulty maintaining sleep or waking too early, may benefit from CBT and bright light therapy. This is important, as giving sleep aids to older patients can increase their risk for falls. Most providers know the benefit of using bright light therapy to help shift workers. Patients should be exposed to bright light during their shift to help them maintain wakefulness and then subsequently exposed to darkness (using room darkening shades) to facilitate sleep. Don’t forget that bright light therapy is also suggested for seasonal affective disorder (SAD), and is the indication with the most support from clinical trial data. Most researchers suggest 10,000 lux for at least 30 minutes per day to treat SAD. 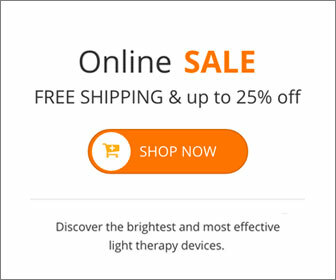 Bright light therapy lamps can easily be purchased online. In most cases, your patient will need a 10,000 lux lamp for effective treatment. This entry was posted on Thursday, April 16th, 2015 at 11:02 am	and is filed under Depression, Light Therapy, SAD. You can follow any responses to this entry through the RSS 2.0 feed.